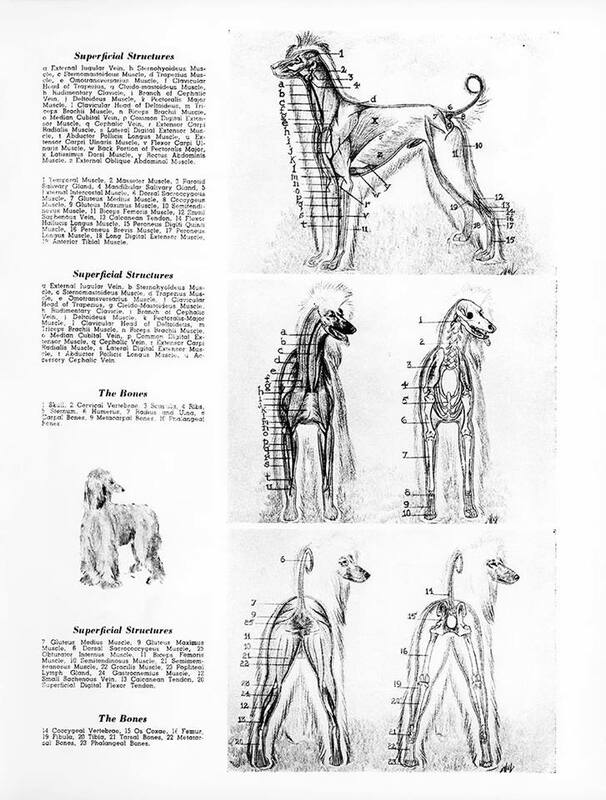 What was “the dog kind” that Ken Ham speaks of? Hat tip to Bronwen Dickey. Bred to be coyote hounds! What is an Afghan hound supposed to look like under all that fuzz? Basically, a dachshund in reverse: short back and long legs! 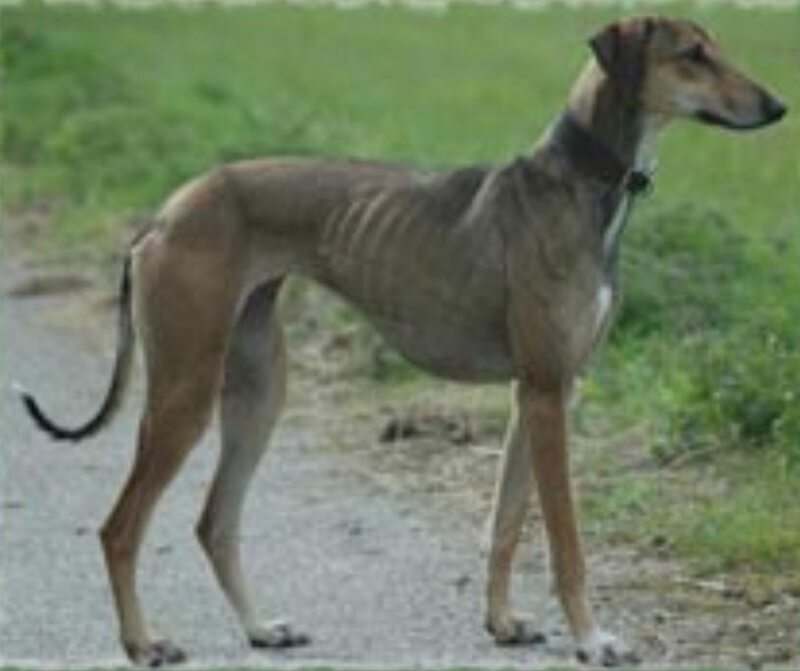 Not at all what people would actually want in a coursing hound. Of course, the vast majority of Afghan hounds in the West aren’t even thought of as coursing dogs. They were objects of conspicuous consumption, and no one seriously considered breeding them for anything other than something to look at. Which is why the dogs look so bizarre. It’s not a cruel breeding practice like the ones used to create pugs and bulldogs, but it’s one that utterly distorts what this type of dog has been for thousands of years. The dog fancy is really not concerned with the real world or “preservation.” It’s concerned with what wins dog shows. This is why the whole concept is faulty in its premise. Jess posted this painting and several others that depict Afghan hound/saluki-type dogs in northern India during the eighteenth century. This particular one caught my attention because it shows feathered saluki-type dogs and patterned Afghan hound-type dogs baying up a tiger. Before you aski, the tiger is not life size. This particular scene was painted by Pandit Nainsukh, who was given special access to the Raja Balwant Dev Singh. The Raja was one of the Jasrotia rajputs, and this particular tiger hunt took place in Jarota, their capital on the Ujjh River in northern India, which is not very far from Kashmir, Afghanistan, and Pakistan. This painting shows that the Afghan hound phenotype was not restricted solely to Afghanistan or adjacent regions in Pakistan. 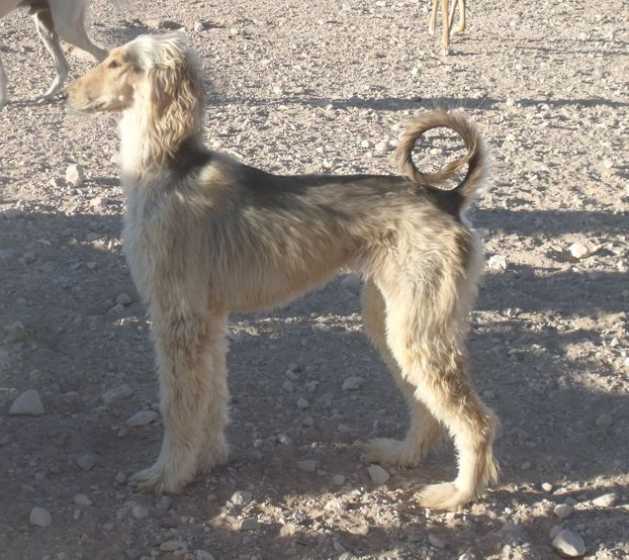 It was also found in India, and appparently, it existed within a landrace that included saluki-type dogs. Salukis and Afghan hounds are regarded as separate breeds in the West, but for most of their history, they were varieties of a landrace that ranged throughout Central Asia to India and west across the Middle East into North Africa. This type of sighthound also included smooth-coated dogs, which do exist in salukis and in Afghan hounds. The differences between these breeds and their close relatives have largely been contrived by the Western fancy. Historically, they were not kept separate from each other. The idea that they would be is something that happened only when they became part of the Western dog fancy. This is one of the oldest landraces still in existence. However, the lineages that produced the current dogs aren’t necessarily that old. They have just remained outside of the Western dog gene pool, which has become contracted through breed formation, and this makes them look more ancient than actually are they are when their DNA is assayed. Check it out at DesertWindHounds. 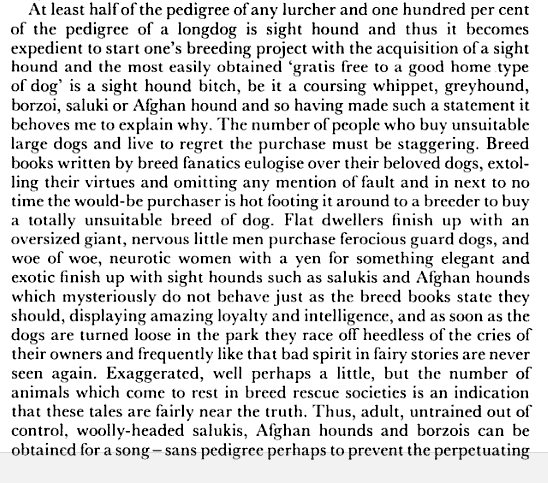 So he essentially says that one can easily procure an exotic sight hound from someone who got it as a fashion accessory. At one time, Afghan hounds were all the rage in the UK. I don’t know why. But I remember reading of how popular these dogs were in the early to mid 1970’s. Those were sort of the zenith of the long-haired hippie-type fashion, so I guess the dogs would have fit the motif.